The International Organization of Motor Vehicle Manufacturers was founded in Paris in 1919 as Bureau Permanent International des Constructeurs d’Automobiles (BPICA). The founders of the first ever international federation of automakers were professional associations in France, Belgium, Italy, Great Britain and USA. In 1986, BPICA was given a new name “Organisation Internationale des Constructeurs d’Automobiles” (OICA). 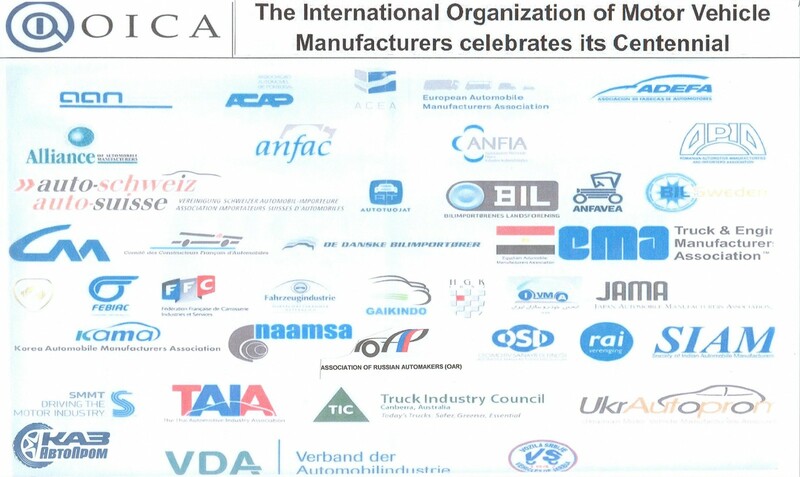 Today, the organization’s membership comprises 39 national trade associations around the world, including all major automobile manufacturing countries, thereby covering virtually the entire motor vehicle industry all over the world. OICA is accredited at the United Nations as the sole representative of the global automotive industry. - Represent the automotive industry at the international level, in particular with intergovernmental and international bodies. The organization maintains four permanent committees which conducy their activities in the fields of technical legislation, communication, statistics and coordination of international motor shows worldwide. These committes represent the common interests of automobile industry, and in particular its member associations, at the international level to governments, organizations and to the general public. Russia is represented in OICA, as a full member, since 2005 by OAR who actively participates in activities of all the four permanent committees, as well as the Selection Committee – a task force with qualified membership. In 2016, OAR successfully hosted the OICA General Assembly meeting in Moscow. Representatives of OAR contineously work at the OICA Technical Committee preparing positions of the manufacturers for discussion at sessions of the UN World Forum for Harmonization of Vehicle Regulations (WP.29). The OICA Centennial is widely celebrated by the international public and business circles. The Centennial events are being held in Paris – the craddle of the organization, the central event being a high-level conference on 14 February under the patronage of President of France. Our greetings to the worldwide automobile community on the occasion of the OICA Centennial and best wishes for further success in the development of our noble industry !